So long October, you were windy, sometimes hot, sometimes cool, a bit wet at times, but always fun when performing Wump Mucket Puppets’ Kooky Spooky Halloween Show. That’s the trouble with performing a holiday puppet show, I guess. Just as things are rolling along at a good pace, the month ends with the holiday that you have been celebrating. Tomorrow morning I will close the 2017 run of TKSHS (that’s short for “The Kooky Spooky Halloween Show) at a private school performance in the Cincinnati area. 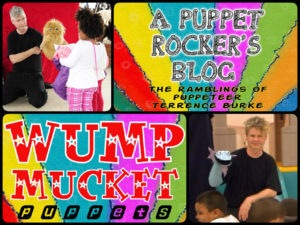 It’s been a great month, and brought my puppetry to several new places too. We opened at the beginning of the month with the Behringer-Crawford Museum in Covington, Kentucky. What a wonderful place this is for children! My kids loved visiting here when they were younger, bringing back many happy memories of those years to me. The little ones in the audience were great, and I am happy to share that I will be back there on December 16th at 2PM with our Frozen Follies holiday show -so mark your calendars now. Half way through the month we were at our final outdoor show of the year at the West Chester Pumpkin Fest. As the opening entertainment for the event, the audience grew as the show was performed. What started as a few dozen people in the seats, grew quickly into hundreds! Thank goodness the wind wasn’t too strong. A few days later the show made a special stop to visit with our pals at the Our Daily Bread Kids Club in Over-The-Rhine. This was our second time donating a performance, and although the audience was small, I could tell that our silliness was enjoyed BIG TIME! Look at this very thoughtful card that our pals sent. This card made my day, knowing that my puppetry was enjoyed and brought smiles to young faces. Thanks Our Daily Bread pals! I look forward to my next visit with you. Our furthest performance of the month was at the Tipp City Public Library, where we were the featured entertainment for the library’s Halloween Family Night. We were greeted by several teenage helpers, that were great in getting the stage and sound equipment into the library on a chilly evening. I was told that this library had not had a puppet show in several years, so the large audience was very welcome. Thank you for having us Tipp City, we hope to see you again soon. As the month got closer to it’s end, I performed our busiest day with two library shows scheduled. The day started very early for me, 4:40AM to be exact. For one reason or another I awoke before the alarm clock to find that the power was out. I suppose this is good, since I had an hour on the road to our first show at the MidPointe Library in Trenton, Ohio. This is another new library, and our audience was very welcoming. I enjoyed meeting the children after the show, especially the three year old girl who dressed-up as Dorthy Gale from The Wizard of Oz (my all-time favorite film). I shall remember the October 2017 tour fondly. The puppets and I had fun sharing make-believe to celebrate Halloween. We met so many great kids and parents, saw lots of cool costumes, and learned which houses give out the BIG CANDY BARS! Thanks to our audiences, the school, library, and museum directors who booked the show, and our media friends who helped promote the shows on TV and radio. Have a happy, and safe, Halloween!